These materials are also available in lengths that range between 17 and 24 feet. Please call to arrange a freight line delivery. Ask about quantity discounts. Please select an outside diameter. 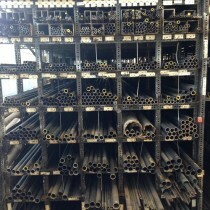 Material certifications are available for 4130 products. There will be a $3.00 per certification charge. 4130 - Chromoly Round Tube 1/4" X .065" X 90"
304 Stainless Steel Round Bar - 1 5/16" X 90"
304 Stainless Steel Flat Bar - 3/16" X 3/4" X 48"